The Xoloitzcuintl is also known as the Mexican hairless, this breed is one of the oldest dog breeds found in the world. They are famous because of their healing and magical powers. This breed possess lots of power and stamina, the most admirable think in this dog breed which make them different from other is their large bat like ears which provide them an amazing hearing. This breed is very strong well-built and agile. This dogs breed is very intelligent affectionate and loving. They are also used as a guard and watchdogs, they are very protective for their family and territory, they are very silent and obedient by nature they are recommended for first time dog owners. They do well with children and older people. 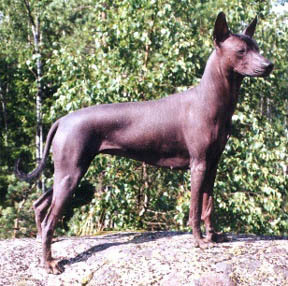 The Xoloitzcuintil breed comes in two varieties, the Hairless and Coated. The Hairless only have a short tuff of hair on head and tail where as the Coated one has full coat of hair that is short and sleek, they are non shedder and odorless. This energetic and bold breed requires early socialization and obedience training. Training should be done with fairness and patience; they will not respond to hard and harsh methods of training. This dog breed is well suited for apartments if they are provided sufficient exercise, they love to go for a walk and enjoy family play sessions. This breed of dogs is not suited for cold weather. Bathing should be done when it is needed otherwise bathing can damage their skin, brushing should be done twice a week. As a dog owner it is your responsibility to provide the right environment to your dog and keep it healthy. If you see any symptoms of disease in your dog be sure to consult a qualified vet to diagnose the problem and provide your dog with an early treatment.